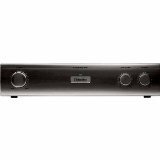 Save 1% on the Definitive Technology In-Wall SubAmp 600 120v Amplifier (Single, Black) by Definitive Technology at The Met Theatre. MPN: UCYC. Hurry! Limited time offer. Offer valid only while supplies last. Definitive Technology's SubAmp 600 is a high powered amplifier specifically engineered to simplify the use of the powerful IWSub in-wall subwoofers. Definitive Technology's SubAmp 600 is a high powered amplifier specifically engineered to simplify the use of the powerful IWSub in-wall subwoofers. It features two discrete high power amplifiers with simple connections in one convenient housing that fits easily in your audio equipment rack. It provides optimal power for effortlessly driving one or two IWSubs in your installation, in the same room or in different zones, whether for whole-house distributed audio or dedicated music or home theater applications.